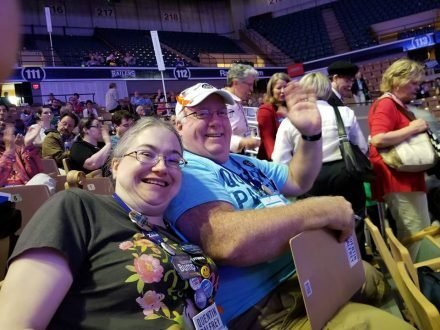 Jen and I were delegates to the #demvention last night and today, and what a great time we had! Last night we were treated to four fantastic speeches from four great leaders: Suzanne Bump, Deb Goldberg, Maura Healey and Elizabeth Warren. I couldn’t be prouder of the Commonwealth that produced these four incredible women, and the reason that they are unopposed in this election was plain for everyone to see. Senator Warren is fired up and ready to take on the next six years of her fight for us, and I’ll be knocking on doors for her this year. We ran into Setti Warren and his wife – told him that we hoped we’d see him again in a state-wide race. I’ve seen Josh Zakim at a number of events this year, and he called me and asked for my support. Bill Galvin didn’t do that. I was already thinking it was time for a fresh voice in that office, and I was happy to support Josh today – he won W&N 49-30. And, like the last time I posted here, thanks Christopher for kicking me in the pants when I ran into you at the convention! Who else was there, and what were your impressions?